A Colorado utilities company has been managing meeting room requests across multiple campuses on a regular basis. Their method for organizing and working with these requests was a manual, time intensive process with many user errors throughout. Digital Workshop Center (DWC) was hired to create a custom Visual Basic Application (VBA) in Microsoft Excel and connected to Outlook. The goals of the project was to reduce the time of manual entry, to reduce the time needed for each user to create a meeting request, and to standardize the process so that requests would be consistent across the company. An Excel and Outlook solution was proposed and drafted to be able find a workable solution. DWC created a clone of the PDF form in an Excel format and used several custom form features to mimic the PDF functionality. The fields of the meeting request were relatively basic, including fields such as meeting title, location, setup options, requests for food or beverages, and/or special needs of the meeting group. In addition, the formatting of the form was made to match the PDF as closely as possible. This user base is not tech savvy and DWC did everything possible to keep the changes of the form, from both appearance to functionality, to a minimum. Some custom VBA logic was needed to handle the various use cases. For example, if a specific location for a meeting was selected, then certain options were allowed/disallowed and the recipient list of the request would change accordingly. 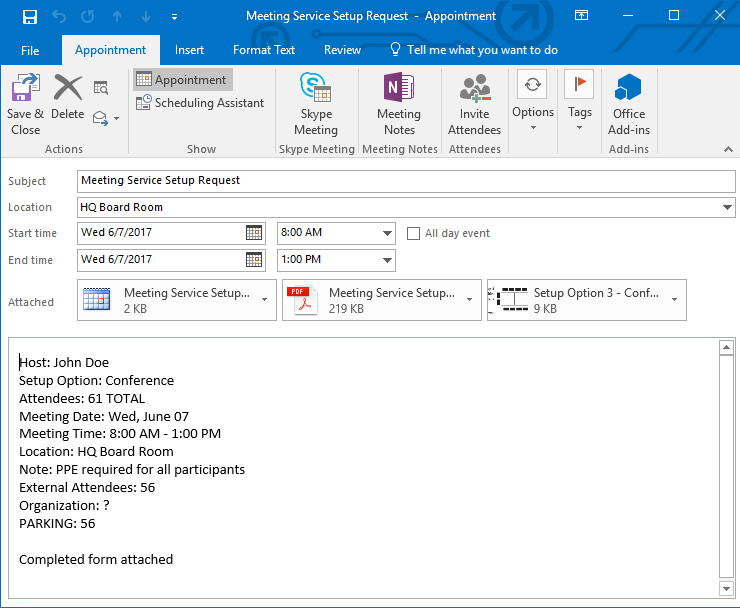 Once a meeting request form had been completed, and the user clicked ‘Submit’, then a custom Outlook appointment was created. 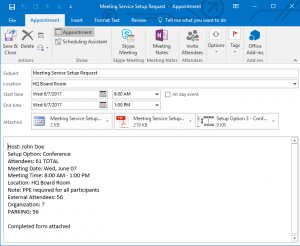 This appointment included all of the fields from the request form, as well as an image attachment of the selected meeting setup style, a PDF attachment of the request form, and an ical file for easy import to various calendars. The user can also add additional attendees and a saved copy of the PDF and ical file were both saved to the same file location as the original Excel file. After several rounds of testing, we were able to deliver an effective final version that has now been implemented across the company. The project manager has reported back that this process is going to save her considerable time and productivity. While this project was simple at its core, there were many tricks throughout the project life-cycle. First, the user base’s limited tech skills made it challenging to utilize too many advanced features of Excel or Outlook. Using some custom forms and logic, DWC was able to minimize the user fear of working with a new product. Creating custom VBA code for some of their meeting request caveats was also challenging with many specific cases needing to be handled by the code. In the end, this application will take some time for adoption throughout the company but the overall time saved by automating their process will soon be realized and the cost of the project will be realized by the client many times over. Need a custom Excel or VBA project? Let’s talk! We have designed Visual Basic for Applications (VBA) custom Excel projects for companies of all sizes across the United States. Fill out the following form to schedule a free consultation. To get started, first fill out the form below to request more information about consulting scheduling and options. Note: Select a date at least one week from today. We will do our best to accommodate all scheduling requests but cannot guarantee a consulting time slot. Add any relevant questions that you would like for your instructor to review in advance of your appointment. Provide as many details as possible for us to be able to best assist you.